As I mentioned in my recent review of Veg As You Go, the street outside my brother’s flat is now home to the fairly busy Tachbrook Street Market, with coffee vendors, fruit and veg vendors, and quite a few food stands. 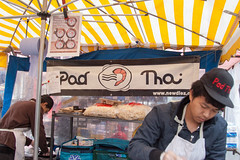 One of the better ones is Pad Thai, a vendor of, well, Newdlez Pad Thai, and the usually are sporting a 30 minute queue for food. But this time, we happened across them on a particularly rainy day, and were able to take advantage of the shorter lines due to the poor weather. 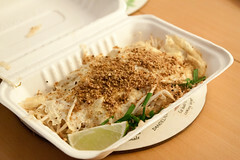 Being a street vendor, Pad Thai doesn’t have a huge menu. The main courses are basically Pad Thai (six varieties, including chicken, shrimp, veggies, and related varieties) and Thai curries (yellow, red, green, and panaeng), as well as a few other noodle dishes. They’ve also got a variety of starters. 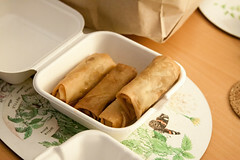 Looking over the options, we decided to split an order of spring rolls, and each got our own order of chicken pad thai. The spring rolls were a nice start to the meal. These were nicely rich Thai-style rolls, with good notes of basil, mint, cilantro, and leek, with a pleasantly crisp wrapper (especially nice on such a soggy day). But the real attraction was the pad thai. They do the signature dish slightly differently at Newdlez. The basics are all they same: they start by cooking up some noodles and your meat with some sauce in the wok (making it to order, one reason the lines are often long), then adding the sauce and some sprouts. But then they change it up: instead of having some scrambled egg as part of the pad thai, they instead do it “omelette” style. They push the nearly-finished pad thai to the side of the walk, and then pour in the egg to make a thin omelette (much like the Japanese tamagoyaki). Once the omelette is done cooking, they flip it over the finished pad thai, move the entire dish (carefully, with two large spatulas) to the takeout container, and then garnish it with peanuts. The result is quite pleasing: this was a good, rich, and spicy pad thai, and the fairly unique serving style with the omelette actually enhanced the dish a bit. This was one of the most enjoyable street food main courses I’ve had in a while. 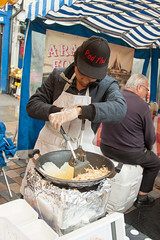 I rather liked Newdlez Pad Thai, and the folks working the stand were very friendly. I’ll have to keep my eye open for them on the Tachbrook Street Market on future visits. There’s a reason they usually have a line! It’s worth noting, by the way, that like several London market vendors, Tachbrook isn’t their only stall. Looking at their website, Newdlez is also a regular vendor at the Lower Marsh market and the Brick Lane SundayUp Market.